Greetings, sisters and brothers! This message will be short—just as the time to mount an effective response to the challenge of carbon pollution and a changing climate has grown short. We are sounding a call to take nonviolent direct action on the climate in Washington DC in late May at the Federal Energy Regulatory Commission. We especially hope that you as a representative of a faith community will consider joining this action on May 27th, “Witness Wednesday”. Your voice and your presence can help underscore the moral dimensions of both the climate crisis and our response to it. But before describing “Witness Wednesday“, we’d like to tell you that our purpose in writing is frankly not to convince you of the imperative of taking action with respect to fossil fuel addiction and planetary warming. We know that most you are already there and are already engaged. Rather, we’re seeking your help in making connections to those in your number who are experiencing a holy restlessness born of desire to take additional significant action NOW. Beyond Extreme Energy is an activist network of organizations and individuals formed in autumn of 2014 to support local front-line struggles against the dangers and costs of fossil fuel infrastructure and extraction. BXE focused its first week long campaign of nonviolent direct action in November 2014 on the Federal Energy Regulatory Commission (FERC) in Washington DC. FERC is the government agency responsible for issuing permits for new interstate energy infrastructure projects such as fracked gas pipelines, compressor stations, liquefied natural gas (LNG) storage facilities, and LNG export terminals. BXE believes that in addition to costs born locally by vulnerable communities, the greenhouse gas potency of methane (the principal component of fracked “natural” gas) requires that we challenge and defeat the gas industry’s current feverish multi-billion dollar expansion. In other words, stopping this massive, generational investment in fracking and LNG export constitutes a line in the sand for the future welfare of the world’s people if we wish to keep hope alive for meeting international climate goals. 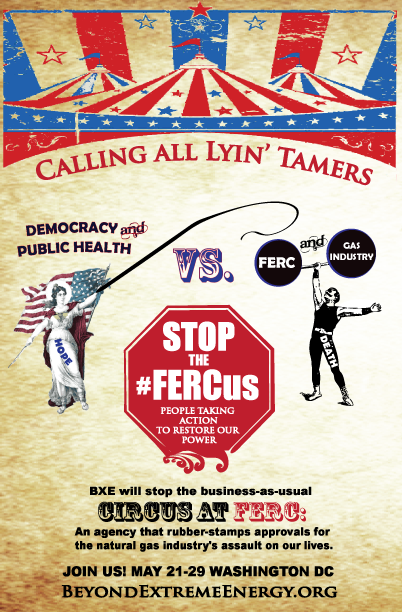 BXE and its coalition partners are returning to FERC May 21-29 for more than a week of creative and powerful nonviolent direct actions to drastically reform this incredibly powerful but relatively unknown federal regulatory agency. The theme for our actions is “Stop The FERCus“. And indeed, we are not going to stop until this fossil fuel-drenched dinosaur from the 20th century is dragged kicking and screaming into the 21st. We need you. 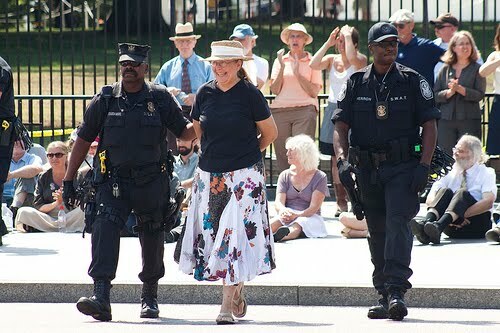 Some of you may remember the August 2011 week of sit-ins at the White House fence against the Keystone XL pipeline when more than 1200 people were arrested including many representatives of faith communities. Industry pundits responded by heaping scorn and derision upon the effort. But those actions galvanized the anti-tar sands movement. No one then could have predicted that six years later the KXL would remain largely unbuilt. We are in the process now of duplicating this David vs. Goliath result with respect to the new “KXL moment” of fracking infrastructure being built on the Marcellus Shale. Eight months of hard work are bearing fruit in strengthened connections, deepened resolve, and effective tactics. We understand that chanting slogans and waving signs don’t build movements and win victories. Connections between people radically invested in their own futures do. If this were just publicity about an upcoming protest, we wouldn’t even be bothering. This is more: an invitation to add your gifts, talents, and experience to our vital and growing network of activists. And there is no better way to explore whether this challenge is the right one for you than to meet face to face this May in DC, sharing meals together and taking nonviolent action in the streets of DC reminiscent of the great spiritual offensives mounted by Gandhi and King. 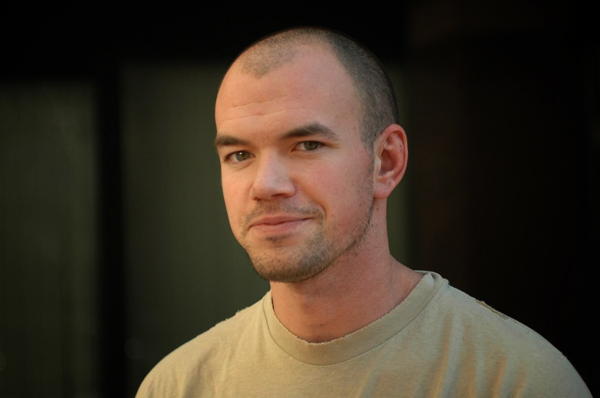 Climate leader and current Harvard Divinity student Tim DeChristopher joined our FERC action last fall. In this letter he co-signed he urges support for our upcoming actions. THE way to organize any physical protest at FERC HQ is to join the efforts of Beyond Extreme Energy. BXE are seasoned and savvy veterans of sitting in at FERC; they come from all over the country; they have shut down the FERC offices at least once. They know their civil disobedience and the DC climate and logistics for these kinds of actions. They are committed to repeated actions at FERC headquarters with climate-based demands. BXE is adept at messaging and morale. They present beautifully to the media & public with signs, messaging clothing & costumes, and 100% non-violence. I strongly advise to become part of their effort, and to learn all they have to teach! We’re going to return to FERC in less than a month’s time. Central to our strategy are the days May 26-29 when we will be mounting an exuberant, art and spirit filled nonviolent blockade of the building. The message of each of the days during this period is going to be shaped in part by special emphases such as fracking, gas pipelines, student divestment movement, and more. We’ve elected to designate Wednesday as “Witness Wednesday” to highlight the participation of our members of faith communities. We invite you to come and take part. For some, this will be a moment when you take a step out on faith into the unknown in order to act upon the growing sense of urgency you feel about making a personal and courageous response to climate change. This is something we all understand and have experienced. And we want to tell you, You will not regret it!